Supreme Court nominee Brett Kavanaugh submitted written responses to over 1,000 follow-up questions from lawmakers on the Senate Judiciary Committee late Wednesday night. The judge’s responses run over 250 pages, though many referred back to answers given during his confirmation hearings and other public writings. As in the hearings, Kavanaugh was evasive when pressed for his views on abortion and related social issues. “As a sitting judge and nominee, principles of judicial independence prevent me from speculating about hypothetical contingent events, particularly involving a controlling precedent of the Supreme Court,” he wrote in response to a question about the events that would follow the overruling of Roe v. Wade. 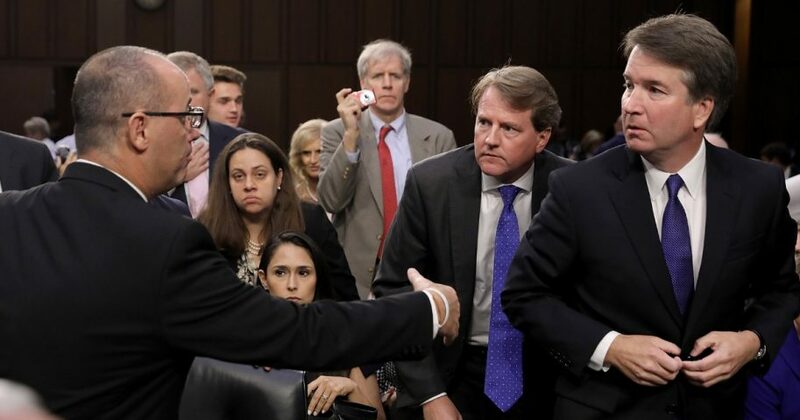 GOP Sen. Chuck Grassley of Iowa, who chairs the committee, asked Kavanaugh to address his fleeting encounter with Parkland, Florida, parent Fred Guttenberg, whose daughter Jaime Guttenberg was killed during the Feb. 14 massacre. Fred Guttenberg approached the judge as he left the witness table for a recess — images of Kavanaugh avoiding the advance circulated widely in social media. The judge also said that he did not ask Capitol Police to remove him, contrary to Guttenberg’s own assertions after the fact. Democrats submitted the overwhelming majority of questions, asking Kavanaugh to respond to 1,278 questions. Grassley staffers noted that five Democratic lawmakers who have already committed to opposing Kavanaugh relayed a combined 586 questions to the judge. Do you think Democrats are being too hard on Kavanaugh? The Democratic questions covered a wide range of topics, including debts he accrued buying baseball tickets, his relationship with a prominent federal judge accused of sexual misconduct, and a possible appointment in the Trump administration. The Washington Post reported in March 2017 that Kavanaugh’s interest was gauged in serving as solicitor general, the Department of Justice official who represents the U.S. before the Supreme Court. Kavanaugh confirmed the report in his responses, saying he had preliminary discussions with then-Sen. Jeff Sessions about the position, but chose to remain on the U.S. Court of Appeals for the D.C. Circuit. Kavanaugh was elsewhere asked about debt assumed buying tickets for the Washington Nationals baseball team, telling senators he currently carries no debt other than his home mortgage. He denied ever holding gambling debt in response to a battery of questions from Democratic Sen. Sheldon Whitehouse of Rhode Island, who asked about past visits to New Jersey casinos as well as a September 2001 email that alluded to a game of a dice. After his confirmation hearings, Democratic Sen. Kamala Harris of California and progressive interest groups circulated an edited clip of Kavanaugh’s comments respecting a case involving a First Amendment challenge to the Affordable Care Act’s contraception mandate. The clip purported to show Kavanaugh referring to ordinary contraceptives as “abortion-inducing drugs,” though the attack was widely debunked by fact checkers. The judge told Democratic Sen. Richard Blumenthal of Connecticut that he used the phrase to describe the arguments of the plaintiffs in that case, who were Catholic priests. The Senate Judiciary Committee is expected to forward Kavanaugh’s nomination to the full Senate on Sept. 20.